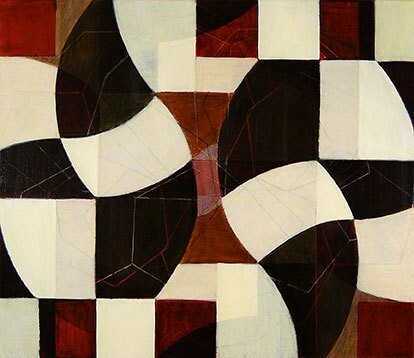 There is a beauty in Mark Pomilio’s work that defies easy explanation. At its most basic, the work consists of four basic shapes — manipulated, rotated, layered and reproduced repeatedly — with shadowing and blocking. The resulting images have both lightness and solidity, depth and surface tension, and an undeniable sense of strength and structure that hints at the reason they are so compelling. As a younger artist, Pomilio discovered the underlying geometry beneath the work of Renaissance artists such as Piero della Francesca, Leonardo da Vinci, and Rogier van der Weyden. These artists were interested in exploring and explaining the scientific and spiritual world through math applied to imagery, and they realized that properly applied geometry assured visual unity and harmony. Pomilio applies these same mathematical principals to his abstract work. His drawings unveil the geometry that underlies growth patterns, and by working from a single shape outward and using math as a framing device, the works are implicitly beautiful. At the same time, Pomilio uses his work to explore a very contemporary scientific field with spiritual ramifications: cloning. Without passing judgment on the value or danger of artificially reproducing cells, the simple fact of his focus poses questions. Pomilio works with very basic tools, mainly a compass and straight edge. He sometimes adopts the conventions of scientific illustration — for example by separating sections of his work by dark lines and then magnifying that section, in much the same way that scientists depict the cross-section of cells. His latest works not only suggest depth and space, but are literally 3-dimensional — the multiplicity of shapes is echoed in the folding and tension of the support materials. Two of the shapes he uses — the pentagon and hexagon — are used by scientists to represent cells; another, a house shape, represents the families to whom cloning may someday be a miracle or a nightmare. There is a complexity to Pomilio’s work that draws us in. We see first beauty, then discern the math, and finally are intrigued by discovering the science. It is not surprising that the marriage of all three disciplines is visually compelling, for they form nothing less than the building blocks of life. Mark Pomilio will discuss his work in the UAMA galleries on Thursday January 21, 2010 at 4pm. A reception follows at 5:00pm.